I hosted a baby shower for my sister a couple of months ago and wanted to share with you the invitations I made. Although she knew she’s having a girl, she wanted to keep the theme simple and a bit gender neutral. Pinterest aided us in coming up with the Cute as a Button theme! It’s a little shabby chic, a little eclectic and a little vintage all rolled into one. I think it came out very darling! I started with using brown paper bag cardstock and envelopes already prepackaged together in sets of 50. I also used cream colored card stock and a couple of paper packs of floral designed paper. I printed the pertinent information on the cream colored card stock then glued everything all together on the inside. Once dry, I machine sewed the lace and then glued coordinating colored buttons on the front using GemTac. Each invitation was different because the paper pack had several different floral designs. This worked for me nicely as I was able to use up some of my button stash! I included in the invitation an insert inviting the guests to bring a gently used and well loved article of clothing to be incorporated into a baby quilt. I love the idea that all the people who love this baby yet to be born will have a little piece of them incorporated into a family quilt. I also invited guests to bring in a used children’s book to start their little library. I’m a sap for momentos and am always the first to “awww!” or “oooh” at a shower! How have you incorporated your style and special touches to your parties? 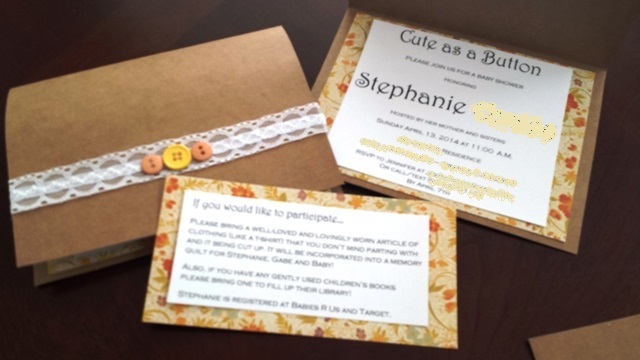 This entry was posted in DIY, Uncategorized and tagged baby, DIY, invitation, shower. Bookmark the permalink. ← I’ve been nominated for the Liebster Award! Still love these every time I see them! These are super cute! I love the lace and buttons. Aww!